No hate no fear, immigrants and citizens, guests and strangers, are welcome here! Mathabo Mofokeng is 86 years old. She is a citizen of the Republic of South Africa. She was born in Matatiele, at the foothills of the Drakensberg Mountains, in the Eastern Cape. She is a citizen of South Africa; Mathabo Mofokeng is South African. Mathabo Mofokeng currently lives in Nhlazatshe, a village in KwaZulu-Natal. Mathabo Mofokeng has lived in KwaZulu-Natal since she was 18 years old. Three months ago, Mathabo Mofokeng lost her ID card and her South African Social Security Agency, SASSA, card. Without those, she couldn’t access her pension. Penniless, she relied on food donations from women in her church. Her electricity was cut off. So, Mathabo Mofokeng did what she was supposed to do. She travelled to the nearest Home Affairs office, in Pietermaritzburg, to have her ID and SASSA cards replaced. An official told her “to go back to Lesotho”. Mathabo Mofokeng says, “I’m scared to go back to Home Affairs offices. An official told me she can’t issue me a new ID; I should go back to Lesotho. 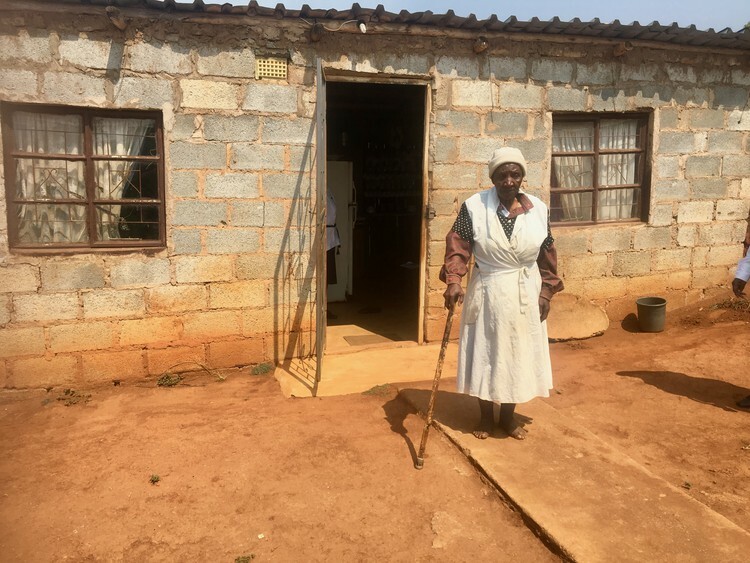 There was a time I went three days without food.” Mathabo Mofokeng is an 86-year-old, destitute South African woman who is now terrified and terrorized as well. And she is not alone. On the one hand, xenophobia is not new to South Africa. Since 1994, the national government has periodically worked to “secure the borders”. With national elections coming up, political parties across the spectrum are ramping up the rhetorics of xenophobia. One hears repeatedly that Home Affairs is in disarray, but the situation goes much further than accidental shambles. For twenty years, Home Affairs so-called Refugee Reception Offices have been a publically acknowledged atrocity. Three years ago, the Supreme Court of Appeals told the Home Office to clean up its act. For three years, the Home Office has refused. Of course, South Africa is not alone in its xenophobia. In India, Assam has effectively told 4 million citizens that they’re not citizens. The majority of the 4 million are, predictably, women. They’re not Indian enough. In Italy, Deputy Prime Minister Matteo Salvini is trying to find ways to strip Roma citizens of Italy of their citizenship. They’re just not Italian enough. In Australia, Huyen Tran, a Vietnamese asylum seeker, faces imminent deportation. She has been in Australia since 2011. She has a six-month-old daughter, Isabella, born in Australia. Isabella can stay, but her mother is just not Australian enough. In the United States, hundreds of migrant children, forcibly separated from their parents, have been moved “under cover of darkness” to a tent city in the Texas desert, where they have been left to rot. This comes just weeks after the United States government threatened to remove citizenship from more than a thousand Latinx U.S. citizens, all delivered by midwives in the borderlands. This is the world in which a State official told Mathabo Mofokeng, a South African native born citizen, to go back to Lesotho. Despite its Latinate appearance, xenophobia is a fairly recently coined word, a word that emerges in the late 19thcentury with the emergence of strong nation-States engaged in global imperial adventures. And what is xenophobia? A deep antipathy, call it hatred, to guests, strangers, and foreigners. Xenophobia doesn’t `merely’ target those born in other lands. Xenophobia targets the citizenship, humanity, personhood, and dignity of anyone deemed foreign, anyone thought to be a stranger, and, most significantly, anyone who is a guest. After reporters began investigating, Home Affairs issued Mathabo Mofokeng a temporary ID. In this brave new world, all it takes to secure your citizenship is a team of investigative reporters. Everyone, say it together: No hate no fear, immigrants and citizens, guests and strangers, are welcome here!